Last week was knitting, knitting, knitting. And a smidge of crochet. I didn't realize there wasn't a balance of the two techniques until the week was over. Odd, considering I'm more known in the crochet community. 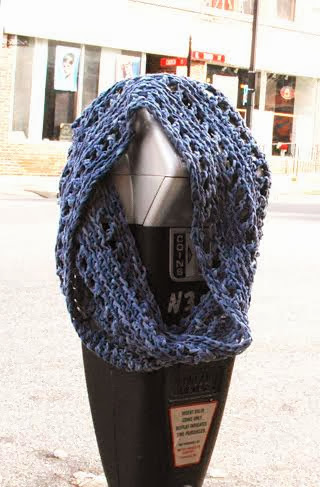 To make amends, the "True Mobius" scarf is crocheted. And it's special because the way it's stitched adheres to the mobius principle. A mobius is more than a circle with a twist. There are oodles of patterns that tell you to cast on—or chain—a number of stitches, give the length a twist, and then knit or crochet round and round. You’re building rows up from the starting point. There are true mobius patterns, of course, but they aren't as common. And don't get me started on the patterns that are worked up in rows before seaming the ends together. For a knit or crochet version, a real mobius starts in the center. It's twisted so that every round you work builds stitching on both sides of the center. This means every row has twice the circumference of the finished work. "Ode to Hal" introduces the true crocheted mobius. I've included a photo tutorial for getting started, which is the challenging part of this project. The scarf is named for a friend, an engineer who is obsessed with sculpting interpretations of math shapes, equations, and concepts. Click here to download the instructions and see how it's done.